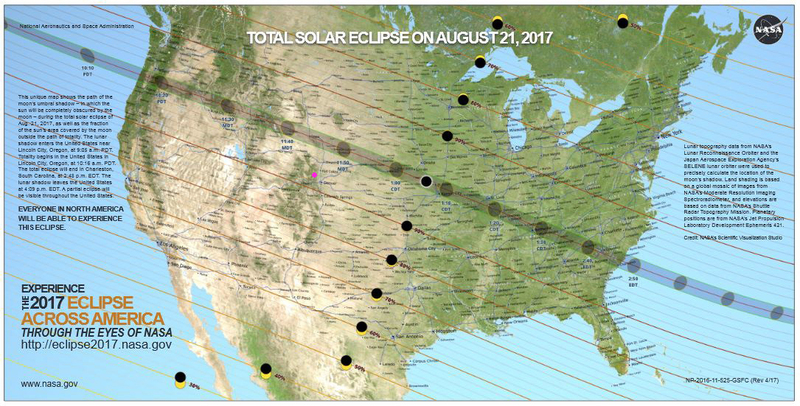 As I’m sure most of you know, this past Monday was the Solar Eclipse that traveled across the US. Being we are a family of geeks, and we live only 3.5 hours south of where the path of totality was (the pink dot is approximately where we are in Colorado), it was definitely time for one more road trip. Our kids started back to school the previous week but Monday was only the 3rd full day of school for them. We decided that this was a great educational opportunity and they could miss a day at school. We weren’t the only ones. Many of the Colorado schools had students missing. I have to give complete credit to my amazing husband for pulling this together. He decided we should go to Rapid City, South Dakota and spend 2 nights there. That way we could visit Mount Rushmore and then drive down into Nebraska on Monday morning into the path of the total eclipse and watch it. 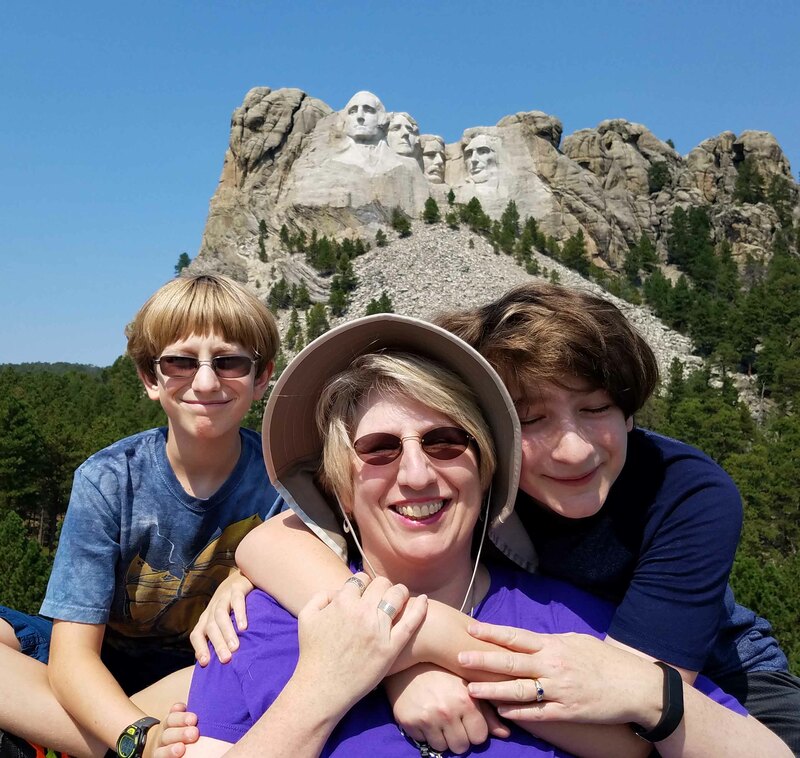 I had always wanted to see Mount Rushmore and hadn’t realized it was so close to us. It was about a 6.5 hour drive, not counting stops for gas and food. He had even ordered an Eclipse watching kit that included 5 pairs of eclipse glasses to look at the sun safely. 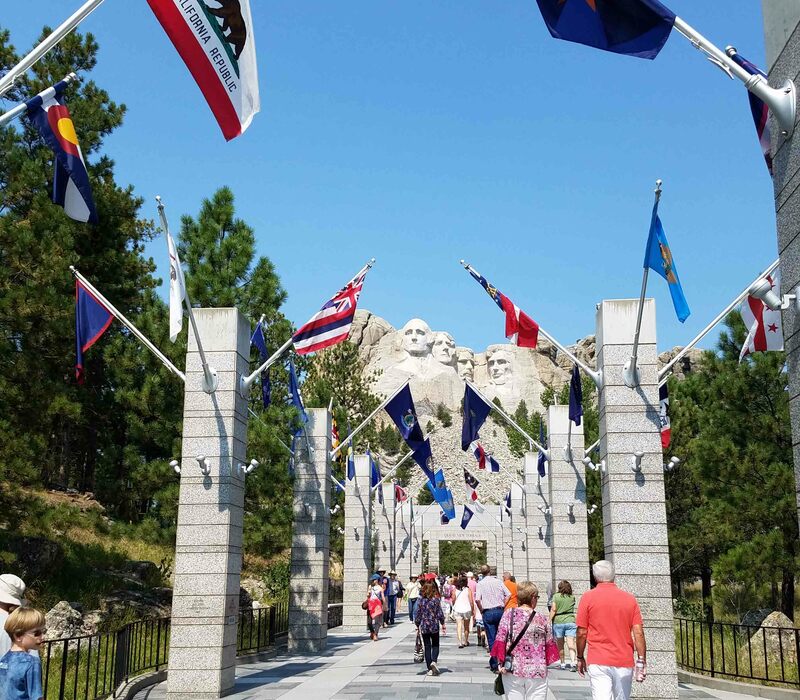 We left home about noon on Saturday and drove all the way to Rapid City, South Dakota. The drive was beautiful and I crocheted on a swatch for a new shawl design. We got to our hotel about 7 that evening, had a quick dinner then called it a night. 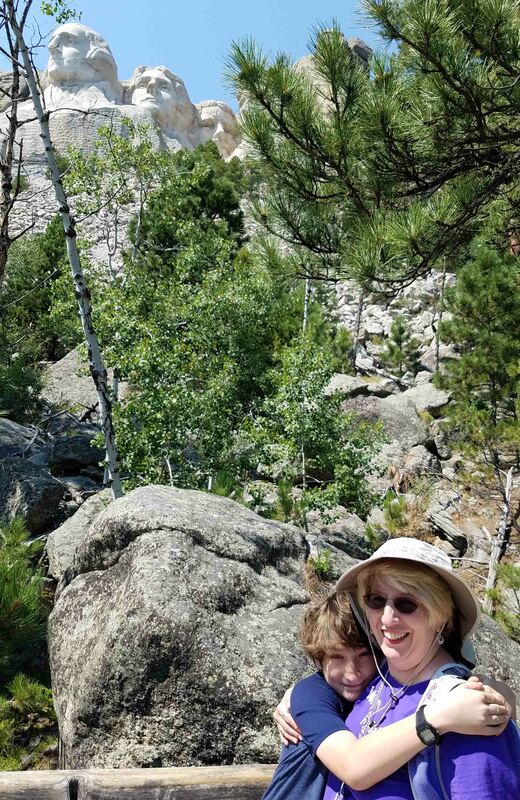 The next day we spent exploring Mount Rushmore. So gorgeous there, and we all hiked up the stairs that took us to the foot of the sculpture. I took that photo from about half way up, the closer we got to the sculpture the more challenging it was to get a good photo. 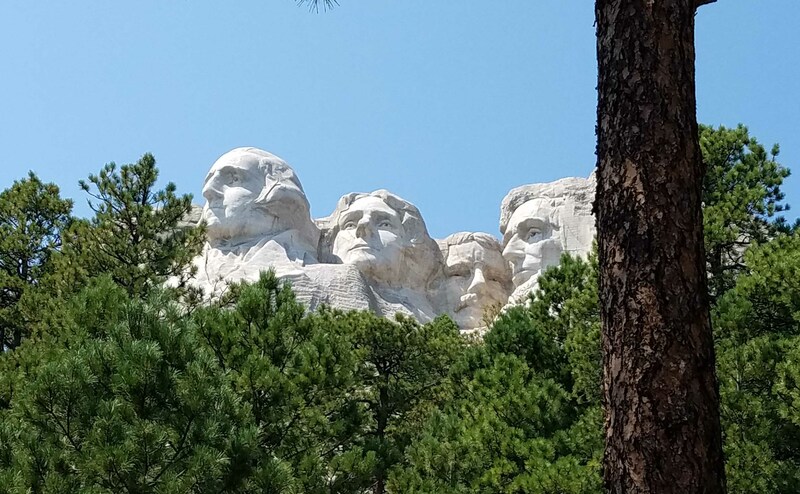 The trees are pretty grown up around the base and the fact we were looking up the presidents’ noses, not ideal photography conditions. Still beautiful and well worth the hike. My oldest stayed with me as I hobbled up the 255 stairs, turned out we had picked the wrong direction to go on the path, if we had started to the left side of the sculpture we would have been going down stairs most of the way. Ah Well. If you get a chance to visit there hopefully you will learn from my experience. When we got back to the hotel later that afternoon I was ready to put my feet up and crochet. 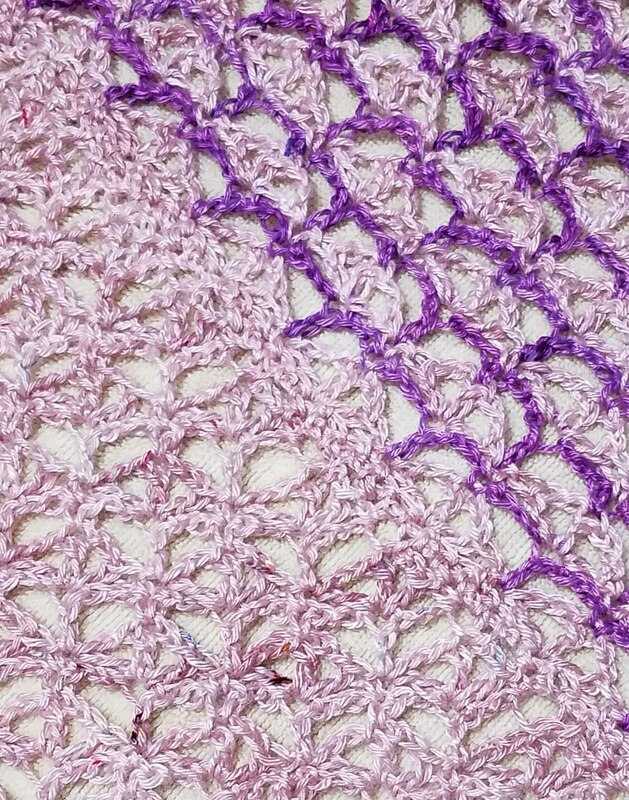 I’ve been asked by Longmont Yarn Shoppe to design a crocheted shawl to help celebrate their 5th year anniversary. I had been swatching with the yarn trying to figure out the right stitch combinations. Having some quiet time in the hotel room was great and I finally got the swatch and math to cooperate. Himself and the kids were playing in the water park that was attached to the hotel. I joined them later to soak in the hot tub and have some dinner at the pizza place. After everyone was water-logged from swimming we went back to our hotel room and packed up in preparation for an early departure the following morning. By 7:30 a.m. Monday we were on the road and headed South toward the predicted path of totality. There was quite a bit of traffic headed the same direction, though nothing compared to what we were seeing on Google maps for the Interstate coming up from Denver to Wyoming. We had a couple of spots we were considering going to watch from, but we were concerned about cloud cover obscuring the sun. We were watching our location in relationship to the path of totality so we knew, if we had to, we could just stop on the side of the road to watch the eclipse. 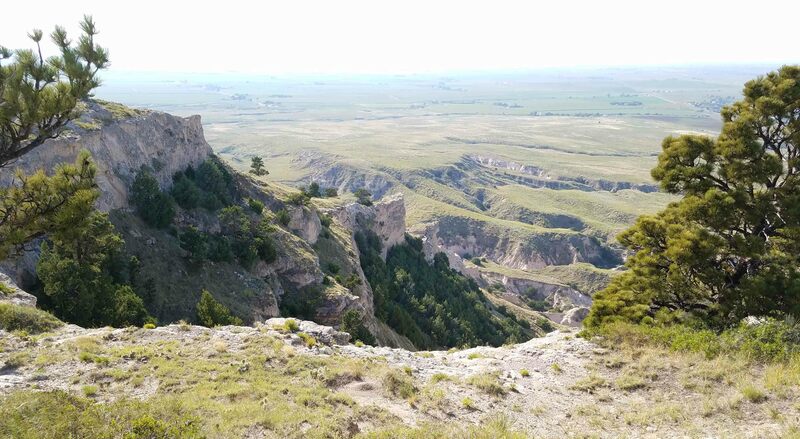 We were heading toward Agate, Nebraska and passed by a scenic overlook that didn’t have a huge crowd. The sky ahead of us was beginning to look very cloudy and we were trying to decide if we should keep going or head back to the overlook. After about 15 minutes we decided to turn around and go to the overlook. It was a great decision. There were around 25-30 other groups there, probably 50 people total. People from Minnesota, Iowa and New York (Long Island) as well as closer by. Everyone had eclipse glasses and was ready to watch the sun as the partial eclipse began. My youngest had science class homework for taking notes on about the eclipse. He had black stickers to overlap yellow sun stickers on the paper, he had to note the time and the percentage of coverage. So we decided on the times he would make his observations then set a series of alarms on my smart phone so he didn’t have to be constantly looking at his watch and missing the eclipse. It was a great family experience as well as a science experience. 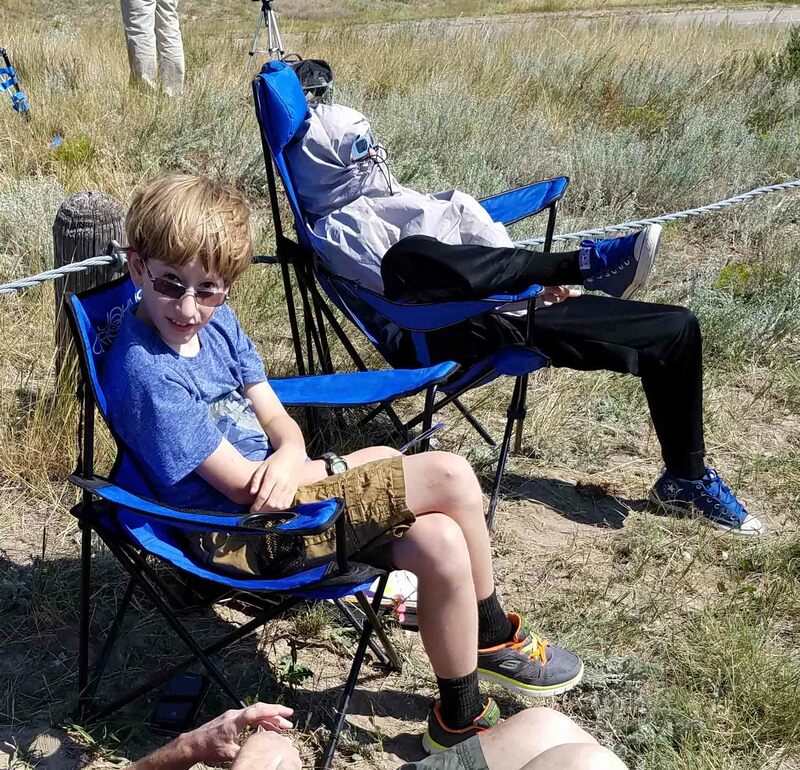 The kids got a little impatient waiting for the totality to happen, but we treated it as a great learning opportunity for them. Fact: Sometimes the waiting in scientific observation is boring. Once the totality got closer everyone got really excited. 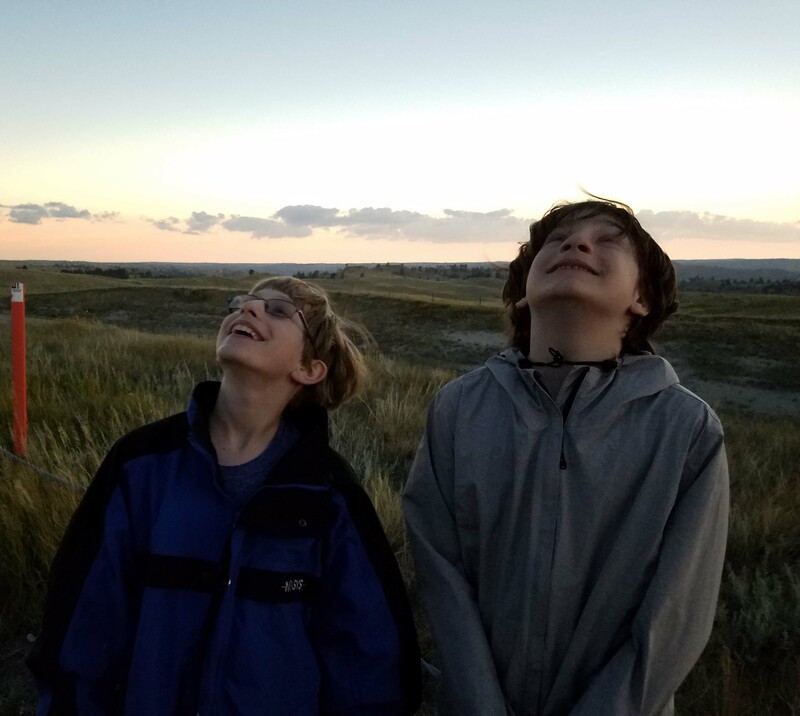 The wind picked up and, being at one of the highest points in the area, we could see the dimness of the totality coming toward us. Those of us watching the sun as the totality happened suddenly couldn’t see anything thru the eclipse glasses. When we took the glasses off we saw the beautiful ring of the solar corona. It was stupendous! The kids declared all the waiting had been completely worth it. My youngest pronounced this the best trip of the summer. Both kids are more determined than ever that they want to be scientists when they grow up. Then we drove to Scotts Bluff to have a picnic lunch and stop by Brown Sheep Wool Company. We weren’t the only eclipse hunters that had decided to stop by Brown Sheep. 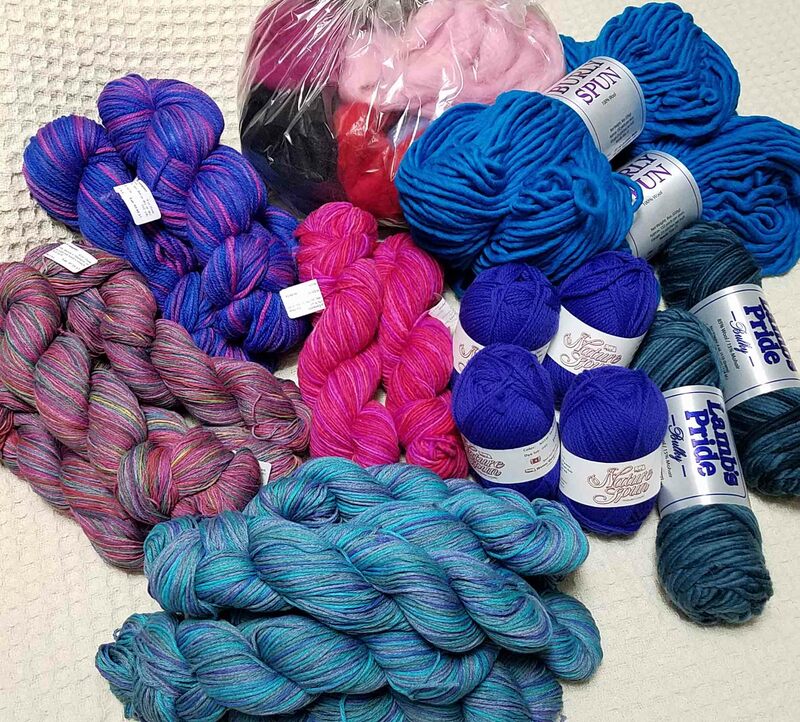 They were really busy, but I managed to find some yarn and fiber to adopt. Quite a bit of that yarn will be presents for Christmas, including slippers for all my family. I had them pick out the yarn and color they wanted because they are getting a bit picky about what they will wear anymore. Believe it or not the hot pink yarn in the center isn’t for me, my oldest picked it out for slippers. I also got to introduce my family to 3 members of the Brown Sheep Family; Brittany, Andy and Peggy. After yarn shopping we drove to the Visitors Center at Scotts Bluff National Monument. Again we were in company with a lot of other folks, but we decided to go ahead and wait in the line to drive to the top of the bluff. We were really glad we did since the views from there were beautiful. 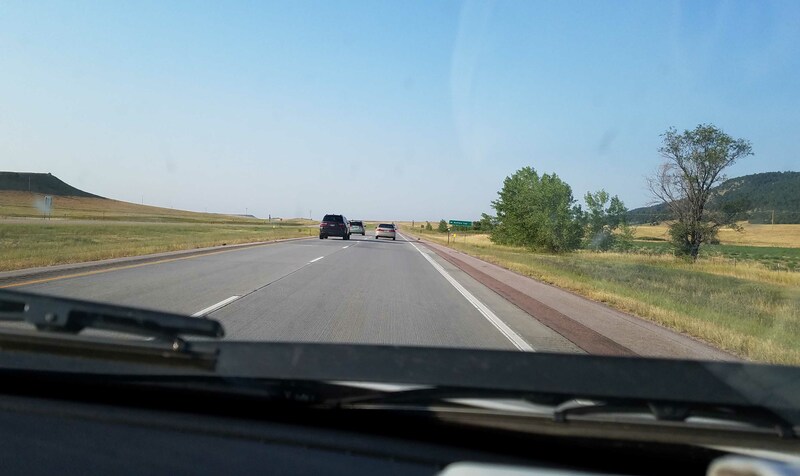 We managed to miss the worse of eclipse traffic returning to Colorado and Denver in particular. With all our stops in Nebraska we thought we would miss it entirely, instead we ended up taking some back roads and avoiding the interstate. We stopped for dinner and ice cream in Ft. Collins and got home at 10:21 p.m. We had 2 very tired kids the next day, especially by the end of their school day, for once I didn’t get any arguments about going to bed. 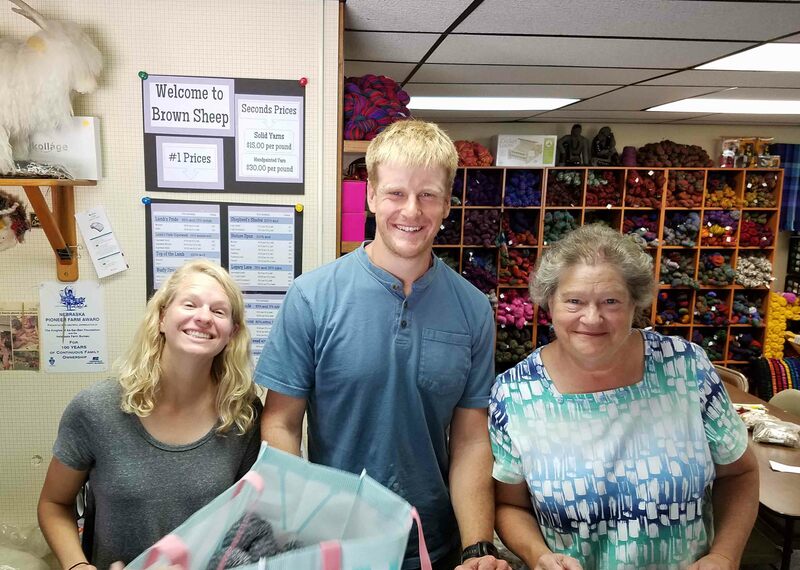 I spent a lot of our trip crocheting on the anniversary shawl design that I am creating for the Longmont Yarn Shoppe, it’s always good to have a crochet project for the road. The launch date for the shawl is September 2nd. You can see a little sneak peak video on their facebook page. I’ve been working lots of math and writing the pattern as well as crocheting the sample since our return. I’ll have more to share with you soon about that shawl and some other designs for this Autumn. This weekend I’ll be selling some of my wire wrapped pins and other crafts at our local craft fair. It’s the first one we’ve had since the flood of 2013. I’m looking forward to seeing lots of local friends and spending time in our little park once again.